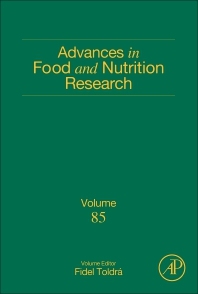 Advances in Food and Nutrition Research, Volume 85, provides updated knowledge on nutrients in foods and how to avoid their deficiency, especially the essential nutrients that should be present in the diet to reduce disease risk and optimize health. The book provides the latest advances on the identification and characterization of emerging bioactive compounds with putative health benefits. Readers will find up-to-date information on food science, including raw materials, production, processing, distribution and consumption, with an emphasis on nutritional benefits and health effects. New sections in the updated volume include discussions on the biological and biomedical applications of egg peptides, omega-3 fatty acids and liver diseases in children, the characterization of the degree of food processing in relation to health, the impact of unit operations from farm to fork on microbial safety and quality of foods, new trends in the uses of yeasts in oenology, and more.